Male vs Female Golden Retriever-Which One Is Better? ProHeart 6 Reviews-Is This The Best Heartworm Protection? A personalized dog collar can provide your dog with the safety of always having your dog’s identification on the dog. I don’t know about you, but those jingling tags can be a real nuisance in the middle of the night when your dog is moving round. Personalized leather dog collar with engraved name plate. The noise from the tags can lead to removing my dog’s collar every night before they go to bed. Who wants to be woke up every time your dog decides to move around the room? That is why I am recommending getting personalized dog collars. No more jingling of dog tags, but knowledge that my dog has his information with him at all times. 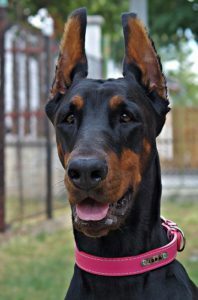 I will provide you with why you should choose a personalized dog collar, the choices of personalized dog collars and the differences between a leather personalized dog collar and a nylon personalized dog collar. This should help you choose the best collar for your dog. Personalized dog collars are a classy way for your dog to display who they are. 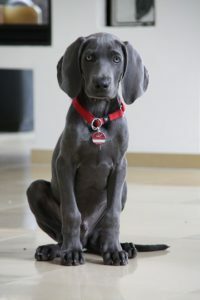 It is easier for someone to get your dog’s information off the collar if they get lost than trying to look at the tags. Information on the tags tends to wear off over time and becomes hard to read. The jingling of the tags can wake you up at night. Tags sometimes fall off, and if your dog goes missing, there won’t be any information on him to get him returned. Dogs tend to be protective of their collars, and don’t always like them removed. With a personalized dog collar, you won’t need to remove the collar at night because of the noise the collar makes. There are many styles to choose from when picking a personalized dog collar. Here are some decisions to make before choosing the right collar for you and your dog. Leather Collar or Nylon Collar – Nylon collars are the most popular. Leather collars make a bigger statement. Personalization on Collar or Personalization on Buckle or Personalization Name Plate. Solid Color or Designer Color. Engraved Name, Embroidered Name, or Silk Screen. Most personalized dog collars will offer from 25 to 30 characters to be printed on the collar. This will give you plenty of room for not only your dog’s name, but also a contact phone number. You might be able to choose from several different text styles along with possible design options like hearts, bones or paw prints to be included with your print. 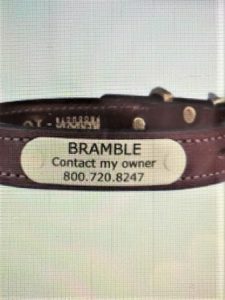 Depending on the material of the dog collar you are choosing, the personalization could be engraved on the collar, the buckle or on a name plate. Or with some collars, generally the nylon collars, the personalization could be embroidered or silk screened on the collar. If you live in the United States, look for a collar from the U.S. Generally they will get shipped to you within 1 to 2 days. Leather dog collars tend to be more stiff than a nylon collar. Some will soften with time. If you are choosing a personalized leather dog collar, there are a few things that you should look for. Check what the back side of the collar is made with. Look for a collar that has some padding or at least a collar that isn’t just the raw backside of the collar. It has the potential to irritate your dog’s neck if there isn’t some type of backing against the collar. A leather collar will look new longer, as nylon collars tend to fade and sometimes fray. Choose a leather collar that is genuine leather. This will last longer. There is also finished leather and unfinished leather. Finished leather is better and will have a glossy or shiny finish. It is easier to clean a finished leather collar. If your dog is a swimmer, a leather collar might not be the way to go, but if you do choose leather, use a leather treatment product on the collar to help it last longer. Of all the personalized leather collars that I have researched, the leather collars only come with a metal buckle. They are not available with the quick release snap buckle. Here are the many choices that Amazon has available for personalized leather dog collars if that is what you are interested in. With a nylon personalized collar, there are many choices to choose from. There are generally more colors to choose from, solid colors, stripes, and print designs. Because of the price and the colors available, nylon dog collars are the most popular collars. Most nylon dog collars will come with a quick release snap buckle that will either be plastic or metal. Sizing on a nylon dog collar is more flexible, since there isn’t a buckle and holes you need to match up. You can easily adjust the size by simply sliding the adjustable buckle to whatever size you need. Nylon dog collars or lighter than a leather collar, and they are also great if you have a dog that likes to swim or get in the mud. They are easy to clean and to dry out. Nylon dog collars will eventually fade over time, and some will also fray around the edges a bit. They will cost less than a leather collar, so they won’t be as expensive to replace as a leather dog collar, but they won’t last as long as a leather collar. 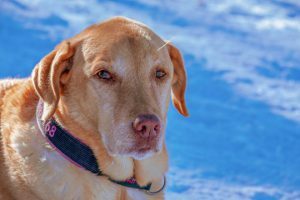 Here are the many choices Amazon has for personalized nylon dog collars if you are interested in seeing what is available. Choosing a personalized dog collar is really a matter of preference of your style and your dog’s style. If price is a factor, then nylon might be the best option for you. If your dog spends lots of time in the water, nylon will handle that better than a leather dog collar. Get rid of that jingle jangle your dog’s tags make with a personalized dog collar. Choose what you think your dog will be most comfortable in. Your dog will usually have their collar on 24/7, so make sure it is something they are comfortable wearing. Since a collar is usually the only thing they are wearing, it is their statement of who they are. Choose something that is your dog’s personality. 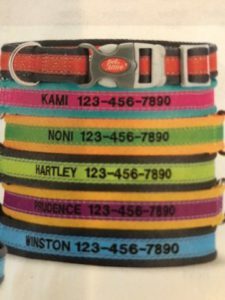 What is most important, a personalized dog collar makes it easy for others to see who your dog is, whether they meet them on the street when you are walking, or if they leave your property and need help to get back home. It is much harder for a dog to lose his collar than it is for him to lose some dog tags. A personalized collar will help your dog get returned to you. If you have any questions or comments, please leave them below. You can follow justforyourdog.com on Pinterest, FaceBook or Twitter for all the latest updates about dogs. Some of the links within this post are affiliate links of which I might receive a small compensation from sales of certain items. © 2019 Just For Your Dog. All rights reserved.